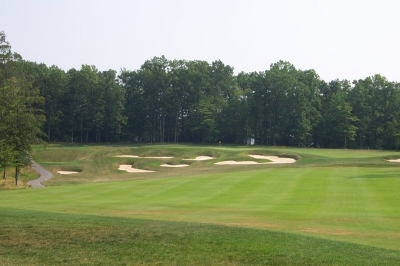 ABERDEEN, MD -- Tom Doak, Beechtree Golf Club's course architect, when asked what his aspirations were for the course, replied that "Our goal at Beechtree was to create a public course that played and felt like it was built in the 1920's." Sounds like an interesting objective, with some potentially unique connotations. The view from the tee of the par four 3rd hole depicts Beechtree's "natural" element. Did Doak mean the "Roaring 20's," famous for mobsters, prohibition, speakeasies and the stock market crash, or perhaps a separate golf version of the same decade, where course design was dominated by classic golf architects who molded layouts in the image of the land? Taking a glance at Doak's work at Beechtree, you'd have to conclude the latter, because the course is one of the finest examples of classic golf architecture in the Mid-Atlantic region, where greens, fairways and tees just seem to naturally blend into the landscape. Doak's drawn a lot of attention in recent times with his Pacific Dunes courses out in Oregon (recently voted #2 by Golf Magazine of "Courses You Can Play"), but no doubt his reputation as a shaper of classic golf art was established at places like Beechtree. 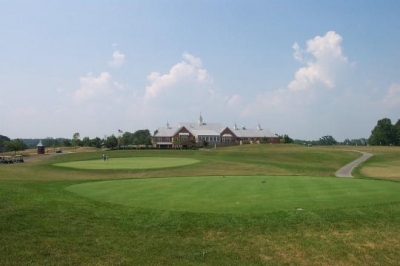 Doak continues: "Beechtree's owner, Jim Knott, is a member at Five Farms (Baltimore Country Club), and the property he owned in Aberdeen was too cut up by wetlands for the industrial development he originally intended for it. He saw a market for a good public course in the area, and he'd always wanted to own a golf course. He chose to hire us after recommendations from Doug Petersan (then-superintendent at BCC) and Bill Coore (who was too busy to take the job), and after seeing our work at Stonewall." A sign fronting the 7th green should read: "bunker is not as close to green as it appears." Beechtree's Head Golf Professional, Michael Gebhard, expands on Doak's views: "We don't have all the flash, the hype, that a lot of other designers bring to the table. That's fine, I'm very old fashioned -- there are no railroad ties or waterfalls, so it's very natural. I think it's refreshing for an architect to come along and do stuff like that, and get back to the way courses were built a hundred years ago. And that's kind of what Doak's whole philosophy is." Gebhard might've missed the timeline by a couple decades, but the feeling's the same. Beechtree Golf Club has the distinction of trying to feel old, and even the course conditioning fits the bill: "We think most golf courses are a little bit too green these days -- they're over-watered. In contrast, Doak wanted this course to play firm and fast, so we really strive to keep watering to the proper level. As a result, you'll probably see brown once in a while here, and we think that's okay to have some off colored grass. It's not dead. It's actually a great playing surface. If you go to Scotland, it's what you're going to find," Gebhard said. Look up at the clubhouse from the 10th tee and marvel at grandeur. Along those lines, the course also tends to play "old-time," which is a good thing. Gebhard says the layout is very subtle, and will take a few trips around to gather in the nuances: "I think it's a course that if you play it a couple times, you'll appreciate it a little bit more, kind of like a Pinehurst #2. The first time you play Pinehurst #2, you're saying 'Okay, what was so great?' But then you play it two, three, four times, and you start to get it, and now you're understanding." Case in point is the bunkering. Some of Beechtree's bunkers don't really seem to belong (like at Pinehurst #2), but Doak insists they're there for a purpose. "There's a bunker by the back tee on #2 that's slightly in play on the 8th hole, but it's mainly there because it looks like it's right behind the first green (even though it's 40 yards further back), and makes it a bit harder to judge the distance for that approach. There's a bunker right in front of the 15th tee, which is part of the bunker complex below the 14th green -- we did that one mostly because it looked good, but the last time I was there I saw someone in it. And the short bunkers in front of the 17th tee are supposed to help orient the tee shot since you can't see the green from the tee." Beechtree's real estate probably won't strike you as spectacular, yet Doak saw great potential: "I liked the site from the beginning -- part woods, part farm fields -- even though there was nothing particularly dramatic about it. There's about 90 feet of elevation change, as I remember, but most of it is in a long tilt from the clubhouse down toward the 7th hole, so there aren't any big hills in play. There was a nice stream running through the property, but one can never be sure whether it will be possible to bring a stream feature into play on a course because of environmental regulations." From the left side of the fairway on 14, fly it over the precipice and bunkers. Doak adds, "I pride myself on the fact that we don't have a design 'signature' that we repeat from one course to the next. I've seen a lot of great courses around the world and I know how many different styles have proven successful, and we want to be free to do whatever feels right with a new piece of property. 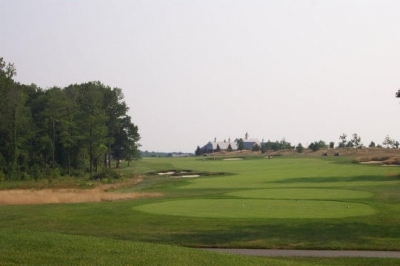 We felt from the beginning that the property suited the classic 'parkland' style of the great courses in the northeast, from Winged Foot to Five Farms, and we ran with that." Yes indeed. Just like a marathon runner, Doak conserved resources, included some well-timed stretch runs, found space for a few breathers, and finished strong. Hard to beat. The course plays just over 7000 yards from the back tees (par 71), but doesn't tend to play long. Perhaps it's because of the playing conditions, but also because of the way the course sets up. After finishing the 15th hole, breath a sigh of relief. Gebhard says part of the old-style feel involves being able to hit lots of different types of shots: "I think that you could come here, and play the back tees and have a very challenging course for a low-handicapper. I think you can play the white tees, or the red tees, and it can be a lot of fun for the average player. There aren't a lot of forced carries off the tee, and there aren't a lot of carries into the greens over bunkers and things like that. And if you'll notice a lot of the greens -- you can run shots in, you can bounce shots in, you can hit bump and run shots." Playing the course, you certainly get that impression. But don't go thinking the approaches to greens will be a cakewalk. Doak explains: "One unusual feature of the course is the number of greens which fall from front to back. It's not unusual for me to use this technique once or twice in a round: it's a great way to make it difficult for good players to make birdies (because it's hard to make the approach stop where you want it), while at the same time it has little impact on 15-handicaps who don't hit many greens in regulation. 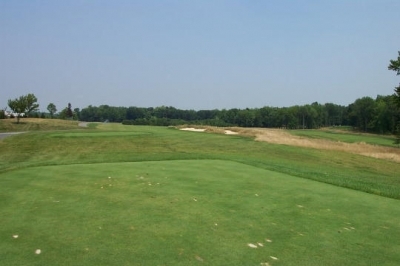 But for some reason, the routing at Beechtree included a lot of holes where the green was located on a natural downslope, so we built a lot of greens which fall away from the line of play." Not to say everything at Beechtree's intended to be natural and "old." The clubhouse is one of the finest you'll see anywhere, with multiple spires pointing to the heavens. The service is worthy of the theme, too, though the attendants do not dress in 1920's vintage outfits. The fairway on the 18th hole is incredibly wide, but the green's a tough one. Looking at the course, highlights include #5, named "Kicker." Gebhard says, "It's an underrated hole and you might not notice it 'til you've played it a couple times. It's a great look from the tee, aesthetically, and when you walk down it, it's just naturally there. It kind of doglegs left, and the whole green complex just sits into that hill and slopes from right to left. Everything's very natural, and it just looks like it was meant to have a golf hole there." Another favorite was #7, a 529 yard par five, requiring quite a bit of classic strategy. The hole moves right off the tee, and even though it's a forced carry, it's not difficult. The risk reward quality comes from a large bunker 20 yards short of the green, but looks like it guards the front edge. The backside will probably be more memorable for first-timers, particularly because of a couple strong and difficult par fours, 14 and 15. Fourteen is 441 yards from the back, with a generous landing area (as is true on most holes) greeting you off the tee. The second shot's all the challenge, where you'll need a mid to long iron to reach a green perched on a 'precipice,' as the yardage book indicates (Doak wrote the hole descriptions -- worth the price of the book just for the phraseology). If you're short and left, you're dead. Period. 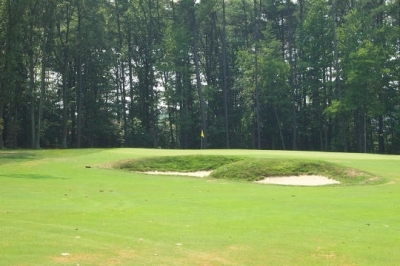 Fifteen is the number two handicap hole, yet probably plays the toughest on the course. 475 yards from the tips, it's a dogleg right hole with trouble on the right side the latter half of the hole. If you don't get enough distance on your drive, the second shot's semi-blind. The hole is named "Elbow," and based on its difficulty, you might take it as an 'elbow' to the jaw if you're not careful. It's hard to pick out just a few highlight holes, because the entire course is unique. Doak has realized his goal of making the holes play on the land, without repeating shots or views. 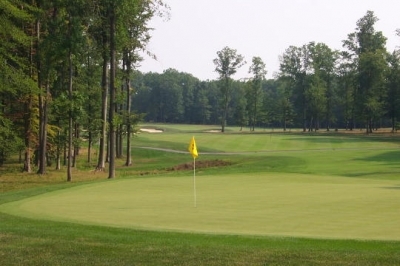 The course's distinction has also been recognized at the state level, seeing as Maryland is holding next year's state open at Beechtree. All in all, Beechtree provides an excellent, daily fee golf experience. It's got the playability, aesthetic qualities and conditioning you'd expect from a high-end golf facility -- even one that's patterned after classic courses of old. And it just goes to show, maybe the 20's weren't so "roaring" after all. Every day of the week, $85. The twilight rate is $55; start times vary during the year. The months of April and November, Beechtree offers a seasonal rate of $70. Note: Beechtree is rated #94 of Golf Magazine's "Top 100 you can play" in the United States.